The last few days have been miserable with these allergies of mine. It almost feels like I have a cold. Speaking of cold.. it's been unseasonably chilly here this year, and the last two days have been so windy! Back to being windy. Doug went out to his car and rushed back in. Did you see what's in our back yard, he asks? I'm like, NO! So we run to the sunroom and there it is. 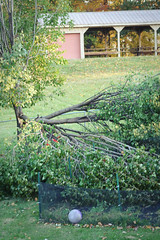 Yeah, the tree in the backyard split sometime between 7:15am - 8am. Poor sand table and umbrella. Their under there somewhere. So happy the kids & dogs weren't out there when it split. I'm going to miss the privacy that tree provides. Maybe we'll plant a new one in the spring. sorry about your fall!! But I laughed!!! the tree looks lonely!! Poor little tree!! Oh no Leah, I'm glad your okay, for the most part with the fall....it could have happened when the garabe man was driving up, Heehee...LOL!!!! Its been crazy chilly/windy here too lately....that stinks about the tree. Oh My Goodness, I can't believe that you fell like that, although I did chuckle when I was reading it. Sounds like something that I would do! What a mess with the tree. We are having the same kind of weather and I was so scared last night to go to sleep with that wind so bad. We have three trees in the back yard that are over 100 years old, and I keep telling my husband I want them taken down! I kept thinking they were going to come crashing into the bedroom. Thank goodness no one was hurt. Sorry about your yucky Wednesday! Oh no! So sorry about your wipeout! I'm with ya, I do that all the time! Bummer about the tree too! Oh, Leah, I hope you aren't sore... but you know, today's post would make a great layout ;o)... interesting twist on some tree embellies or pp, huh? OUCH!! on all accounts!! 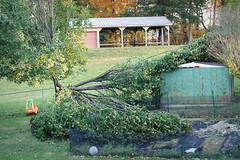 Really glad that you are ok, and like you said, that the kids aren't under that mess of a tree limb!! i think it fell because tricia's kids were climbing all over that sucker when we visited you. i'd blame her if i were you.